The U.S. could become dependent on foreign sources of shellfish, since the harvest of four commercially important species is declining. PORTLAND, Maine — Valuable species of shellfish have become harder to find on the East Coast because of degraded habitats caused by a warming environment, according to a pair of scientists that sought to find out whether environmental factors or overfishing was the source of the decline. The scientists reached the conclusion in studying the decline in the harvest of four commercially important species of shellfish in coastal areas from Maine to North Carolina — eastern oysters, northern quahogs, softshell clams and northern bay scallops. They reported that their findings came down squarely on the side of a warming ocean environment and a changing climate, and not excessive harvest by fishermen. One of the ways warming has negatively impacted shellfish is by making them more susceptible to predators, said the lead author of the study, Clyde MacKenzie, a shellfish researcher for the National Oceanic and Atmospheric Administration who is based in Sandy Hook, New Jersey. "Their predation rate is faster in the warmer waters. They begin to prey earlier, and they prey longer into the fall," MacKenzie said. "These stocks have gone down." NewsWould flooding the deserts help stop global warming? MacKenzie's findings, the product of a collaboration with Mitchell Tarnowski, a shellfish biologist with the Maryland Department of Natural Resources, appeared recently in the journal Marine Fisheries Review. The findings have implications for consumers of shellfish, because a declining domestic harvest means the prices of shellfish such as oysters and clams could rise, or the U.S. could become more dependent on foreign sources. The scientists observed that the harvest of eastern oysters from Connecticut to Virginia fell from around 600,000 bushels in 1960 to less than 100,000 in 2005. The harvest of the four species declined from 1980 to 2010 after enjoying years of stability from 1950 to 1980, they found. The scientists reported that a positive shift in the North Atlantic Oscillation led to the degradation of shellfish habitat. The oscillation is an irregular fluctuation of atmospheric pressure that impacts weather and climate, which in turn affects things like reproduction and food availability for shellfish. 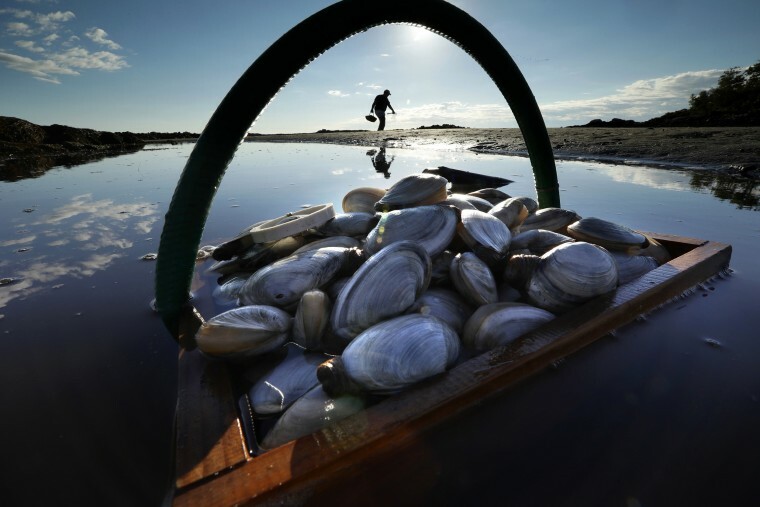 The study mirrors what Maine clam harvesters are seeing on the state's tidal flats, said Chad Coffin, a clammer and the president of the Maine Clammers Association. Maine's harvest of softshell clams — the clams used to make fried clams and clam chowder — dwindled to its lowest point since 1930 last year. It will take adopting new strategies, such as shellfish farming, for the fisheries to survive, Coffin said. "Clammers aren't the reason there's no clams," he said. "We need to adapt, we need to focus our efforts on adapting to the environment we have." Some near-shore shellfish harvests in the U.S. remain consistently productive, such as the Maine sea scallop fishery, which takes place in bays and coastal areas in the winter. The state's scallop fishery bottomed out at about 33,000 pounds in 2005, but has climbed in recent years, and its 2017 total of almost 800,000 pounds was the most since 1997. Many in Maine attribute the health of the fishery to conservative management, said Alex Todd, a scallop fisherman who also works the waters off Massachusetts. "Up and down the coast, there have been good years recently compared to 10 or 15 years ago," he said. But the scientists' findings track with others who have studied the impact of warming waters on shellfish, such as Brian Beal, a professor of marine ecology at the University of Maine at Machias. Beal, who was not involved in the study, has said rising seawater temperature could spell "doom and gloom for the clamming industry and probably for other industries as well." That's especially true of valuable species that are important food items, like clams and mussels, he said. "None of this can be attributed to overfishing, a term that is used willy-nilly and applied erroneously to these declines in commercially important shellfish," Beal said.